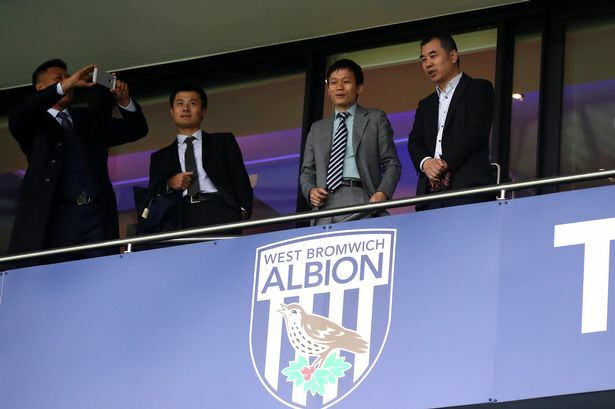 In a recurring theme for West Midlands football clubs, West Bromwich Albion was bought by Chinese investors in August. West Brom then chairman Jeremy Peace announced a deal had been struck to sell West Bromwich Albion Holdings, the Baggies&apos; parent company, to a Chinese investment group headed by Guochuan Lai. Mr Peace stepped down as chairman after 14 years in the role and 16 years on the club&apos;s board and was replaced by John Williams, former chief executive and chairman of Blackburn Rovers. It followed similar deals with Chinese investors during 2016 for Wolverhampton Wanderers and Aston Villa. The campaign against the use of Birmingham&apos;s anchor assay symbol in India reared its head again in August. Campaigners were hoping to have the matter raised in Parliament after it emerged earlier in 2016 that Assay Office Birmingham was opening a base in Mumbai. The move means the anchor mark, which has denoted the quality of a piece of jewellery for more than 240 years, can be used in the subcontinent. It drew sharp criticism from jewellery manufacturers which accused the Assay Office of selling Birmingham&apos;s historic silver trade down the river. High street optician Specsavers announced a blow to the city&apos;s manufacturing sector when it announced it was closing a lens factory in Aston, threatening around 200 jobs. The group, one of the biggest eyecare and audiology companies in the country, launched a consultation with staff, saying the move came as a result of constantly reviewing its operations to ensure it remained efficient. The firm also runs manufacturing operations in Kidderminster and Southampton. In a statement, Specsavers&apos; supply chain director Sean Lawe said: "Regretfully, we have announced that Aston Labs, a Specsavers-owned facility providing optical lenses to stores in the UK and Ireland, is being considered for possible closure." London&apos;s housing crisis crept its way up to Birmingham, according to new data released this month. The number of people in Birmingham and the surrounding area who own a home plummeted and the number forced to rent from private landlords increased. The warning came in a study which said the housing crisis was no longer confined to London and the South East and was now spreading to the Midlands and the North of England. Data from think tank the Resolution Foundation released in August showed the proportion of the West Midlands population who owned a home had fallen from 70.5 per cent in 2005 to 59.3 per cent today. Birmingham&apos;s Ort Gallery secured £100,000 in new investment from Arts Council England to support its work creating visual art by and for the city&apos;s diverse artists and communities. The money came from the Arts Council&apos;s &apos;Elevate&apos; fund which is aimed at strengthening organisations which make a significant contribution to the creative case for diversity. Ort Gallery, in Balsall Heath, is an artist-led company presenting exhibitions by artists from diverse backgrounds that address social injustice and promote community cohesion. The £100,000 investment is being used to support the gallery to develop its business plans to manage and produce larger projects, helping to build its long-term sustainability. Following on from July&apos;s rumours surrounding Andy Street, the Labour party unveiled Siôn Simon as its nomination for the 2017 mayoral election. The former MP for Erdington looked like an odds-on favourite to become the West Midlands first directly elected mayor after securing the support of 71 per cent of Labour Party members in his head-to-head contest with former city councillor Steve Bedser. Labour became the first mainstream party to select its candidate for the election, since when the Tories, Greens and Lib Dems have all named their candidates. Mr Simon said: "The election is a vital opportunity - amid Tory austerity and Brexit chaos - to bring real Labour government to the West Midlands." Designs were unveiled in August for one of Birmingham&apos;s tallest apartment blocks. Plans were lodged for the partial demolition and redevelopment of the Ringway Centre - the curved building spanning the length of Smallbrook Queensway - which include a 26-storey residential tower. The project was never far from the headlines during 2016 with campaign group Brutiful Birmingham and architect and Birmingham Post columnist Joe Holyoak both calling for the building to be saved. The plan is to demolish the section closest to Holloway Circus island and renovate the section running up to Debenhams. The Birmingham school finance scandal which led to the resignation of so-called superhead Liam Nolan this year prompted calls for councils to be given greater powers to monitor funding of academies. Mr Nolan stepped down as head and chief executive of the Perry Beeches Academy Trust after investigations, prompted by an internal whistleblower, found financial mismanagement - including £1.3 million payments to suppliers linked to school governors without contracts. A Government investigation found Mr Nolan was paid an extra £160,000 over two years, on top of his £120,000 salary, via education company Nexus Schools. This, along with a string of scandals at other academies throughout the country, has prompted the Local Government Association (LGA) to call for councils to be given greater powers to oversee academies.